Digi-Schlock: BATTLE BEYOND THE STARS (Shout! Factory Blu-Ray) – Schlockmania! It’s been a while since Corman fans were last able to enjoy a New World Pictures classic on blu-ray. Thankfully, Shout! 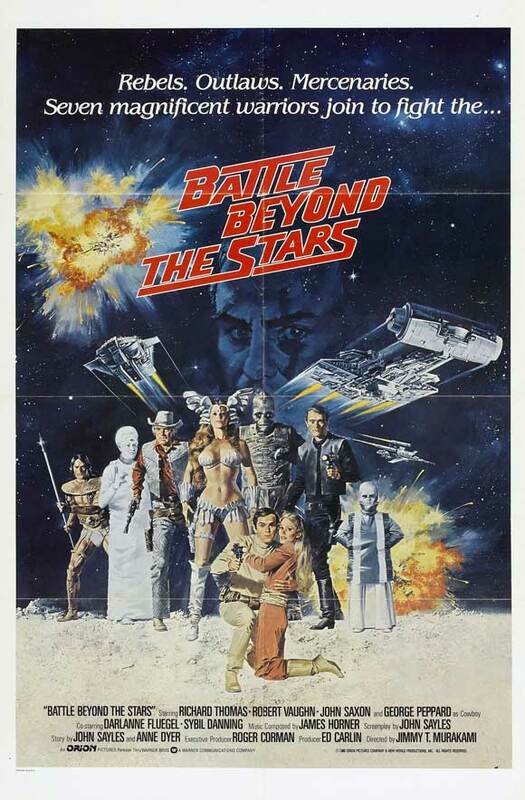 Factory has added a fan favorite to their collection of Corman blu-ray releases in the form of Battle Beyond The Stars. This release gives the film the special edition treatment it deserves, pairing a sharp looking transfer with a collection of extras that combine material from its DVD edition with a few worthwhile new featurettes. This set starts off nicely with a new anamorphic, high-def transfer. It’s a huge improvement on the old VHS and DVD versions of this title, bringing a new level of depth and detail to the image. There is some periodic speckling and a bit of element damage but the majority of this presentation is truly impressive. The primary-colored lighting really pops in this presentation and the frequent effects scenes have a clarity that shows off their old-school opticals to handsome effect. There are two audio options: a standard Dolby 2.0 stereo mix and a lossless 5.1 remix. It makes effective use of the film’s magnificent James Horner score as well as some great directional sound effects (designed by John Carpenter musical collaborator Alan Howarth!). Fans will also be happy with the expansive set of extras on this disc. For starters, it preserves the two commentary tracks recorded for the New Concorde DVD of this film. The first track pairs producer Roger Corman with screenwriter John Sayles while the second is a solo track for Gale Anne Hurd, a future producer who was Corman’s assistant at the time of the film. The Corman/Sayles commentary is a worthwhile listen for fans of either person. Both men discuss the film, with Corman focusing on the production specifics while Sayles discusses the challenges of writing a sci-fi film driven by effects. You’ll also learn about director Jimmy Murakami, how Corman came to be involved with him and what became of him after working on this, his only live-action feature. However, the big surprise with this track is that the film-specific stuff takes up only about half the chat. They go back and forth between discussing the film and broader topics like the evolution of visual effects techniques and how editing can be used to trick audiences into thinking they’re seeing something they didn’t see. Any b-movie fan will want to check in on this chat. In comparison, Hurd’s commentary is rather dry and suffers from periodic gaps… but it’s worth sticking with because she discusses a lot of nuts and bolts minutiae of the production. 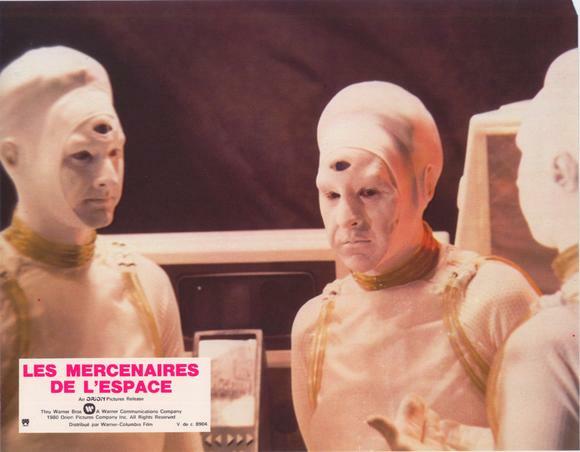 For example, you find out the film had 160 effects shots on a budget of $2 million (the cost of everything, including star salaries) and why used fast-food containers were such a popular construction material for the spaceship sets. Most importantly, she talks about working with James Cameron: she fondly describes how he distinguished himself as a rising star on this film and how this film was ground zero for their successful production partnership. There is also a pair of featurettes created for this new edition. The first is called “The Man Who Would Be Shad” and is an interview with star Richard Thomas. He proves to be a witty and charming interview subject, discussing Corman’s “bandit moviemaking” with affection and enthusiasm. In the space of about 15 minutes, he goes into detail about his co-stars, where this film fits into his career and some fun memories about seeing the film in theaters. Clips from the film are edited in as a counterpoint to his comments and they help create a snappy, energetic pace. That said, the bigger attraction here is the second featurette, “Space Opera On A Shoestring.” It consists of interviews with a variety of the people involved in the special effects as well as the editors and a few key members of the production staff. The end result offers a wealth of detail on the interpersonal details behind the film’s hectic production schedule, including colorful tales of a young James Cameron in action (a tale about an argument with the d.p. is a highlight) and how Corman could be a ruthlessly efficient taskmaster when the production ran into trouble. Virtually every effects guy interviewed here went on to a major Hollywood career so it’s fascinating to hear their tales of the blood, sweat & tears that went into putting together their big break. The remainder of the disc is devoted to an expansive array of promotional materials for the film. There is a rough but watchable theatrical trailer and a radio spot as well as image galleries that feature behind-the-scenes photos, stills and a variety of ad mats. It’s worth going through the image galleries to see pictures of a pre-fame Cameron in action on the set (there’s also a shot of the alien from Without Warning in one gallery for reasons unknown!). All in all, this disc of Battle Beyond The Stars is a great deal for fans. The new transfer looks and sounds great, it benefits from the A/V boost offered by the blu-ray format and it pairs together some quality vintage supplements with some smart new additions that fill in the informational gaps. Corman enthusiasts need to pick this one up. As our gift to you, we’re offering an iron-on of the original Battle Beyond The Stars theatrical key art exclusively from ShoutFactory.com when you purchase either the DVD or BD.Only available here while supplies last!Click To Enlarge30th Anniversary Special Collector’s Edition!Seven mercenaries are recruited from throughout the galaxy to save a peaceful planet from the threat of an evil tyrant bent on dominating the entire universe. Among them are a lizard-like humanoid, a space cowboy, a female warrior and a brooding killer-for-hire.Also available on Blu-ray. As our gift to you, we’re offering an iron-on of the original Battle Beyond The Stars theatrical key art exclusively from ShoutFactory.com when you purchase either the DVD or BD.Only available here while supplies last!Click To Enlarge30th Anniversary Special Collector’s Edition!Seven mercenaries are recruited from throughout the galaxy to save a peaceful planet from the threat of an evil tyrant bent on dominating the entire universe. Among them are a lizard-like humanoid, a space cowboy, a female warrior and a brooding killer-for-hire.Also available on DVD.